Tourists are smarter than you think. They know what’s worth bundling up and braving the cold for in the wintertime. Look how many of them head for DUMBO — to the intersection of Washington and Water streets first and foremost. The cobblestoned site is “Selfie Central” when spring breezes blow through the neighborhood —and Arctic blasts, too. Brooklyn Bridge Park visitors pose in the shadow of the Manhattan Bridge. People pose so that the Manhattan Bridge, framed by red-brick buildings, stands in the background of their photos. The detail that everybody loves is that the Empire State Building is visible between the bridge’s metal supports. Look closely at the photos you take. The mighty skyscraper is there, though its image is a bit hazy when skies are gray. The Washington Street buildings that frame the bridge are landmarked. Originally they belonged to, or were leased by, Robert Gair, an important industrialist of yesteryear. Brooklyn Bridge Park’s pebble beach offers an eye-popping view of the World Trade Center, Lower Manhattan and our borough’s world-famous bridge. In the 1870s, the Scottish-born Civil War veteran invented machinery for making corrugated paper and for folding cardboard boxes. This was a very big deal for businesses that sold packaged food. For a while, the Robert Gair Company was America’s largest paper-box manufacturer. One of the buildings on this photogenic block, 26-38 Washington St., was the first paper factory Gair constructed in the neighborhood, the city Landmarks Preservation Commission’s designation report about the DUMBO Historic District says. Prior to that, his operations were located in what is now Tribeca. Jane’s Carousel draws the attention of passersby in Brooklyn Bridge Park. Gair’s many industrial buildings in DUMBO were called Gairville. Benjamin Finkensieper designed American Round Arch-style 26-38 Washington St., which was constructed in 1887 and 1888. It’s now a rental-apartment building that belongs to Two Trees Management. 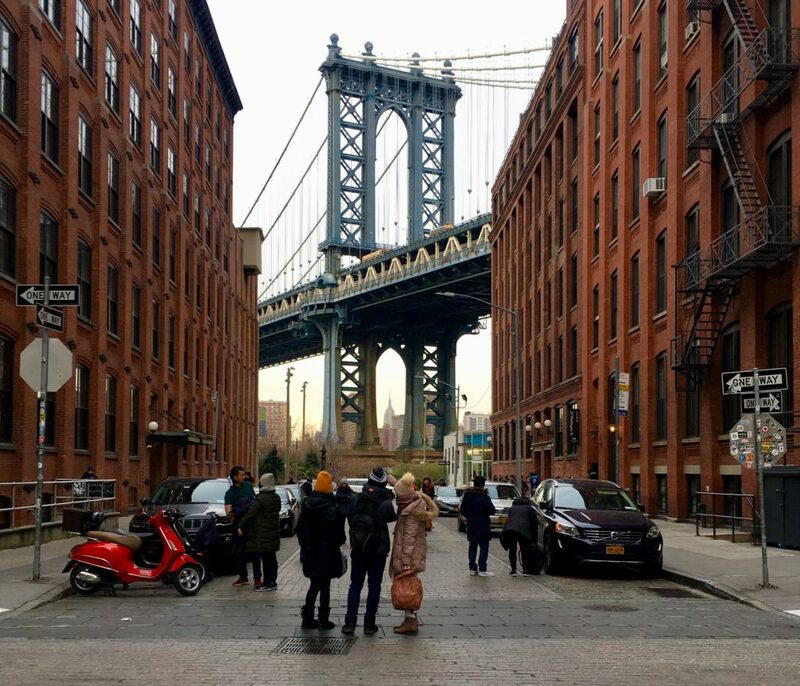 The Walentas family’s company played the leading role in DUMBO’s transformation from a deteriorating industrial area to an upscale residential and office neighborhood. The DUMBO Clocktower and the Empire Stores complex are bathed in pale winter light. Nearby, on the East River shoreline, Brooklyn Bridge Park is another winter visitor magnet. You can’t sunbathe on the lawn by the Manhattan Bridge without risking hypothermia. Nevertheless, plenty of people are walking around and soaking up the scenery. The park’s pebble beach has an iconic view any time of year of the Empire Stores complex, Jane’s Carousel, the Brooklyn Bridge, the World Trade Center and the Manhattan skyline. When it’s particularly cold, a coating of ice forms on the boulders along the park’s shoreline. From Empire Stores’ atrium, you can see the property’s glass-clad offices and 19th-century brick facade. Empire Stores was built in 1869 by Nesmith & Sons with additions made in 1885. During the first decades of the 20th century, John and Charles Arbuckle used the mammoth brick warehouse complex to store unroasted coffee beans. Though they vacated the place in 1945, coffee beans were still scattered on the wood floors when we toured it with Jack Cayre in 2014. The previous year, the Brooklyn Bridge Park Board of Directors had awarded his family’s real estate firm, Midtown Equities, a 96-year lease of Empire Stores in partnership with Rockwood Capital and the HK Organization. On Empire Stores’ roof, visitors snap photos of East River vistas. The partners did a painstaking restoration and adaptive reuse of the landmarked property at 55 Water St., which had been vacant since the Arbuckles’ departure. It opened for business as an office, retail and restaurant complex in 2017. Its red-brick exterior walls are two feet thick. When you step into shops such as J. Crew or West Elm, you’ll find pine columns from the 19th century that are hard as rocks. Interior walls made of gray schist are visible in an atrium that leads to Empire Stores’ rooftop, which is open to the public. No matter how low the temperature drops, you’ll want to stay on the roof because of its views of the Manhattan skyline, the East River and the park. This is what Jane’s Carousel looks like when you stand on Empire Stores’ rooftop. Back down on the ground, there’s another architectural icon in Brooklyn Bridge Park — the Tobacco Warehouse. Following a makeover designed by Marvel Architects, the landmarked building at 45 Water St. is now St. Ann’s Warehouse. Its 700-seat theater is like a building within a building with glass bricks near its roofline. Marvel preserved the original walls, which were built in the 1860s. Part of the complex was left roofless and turned into a garden. 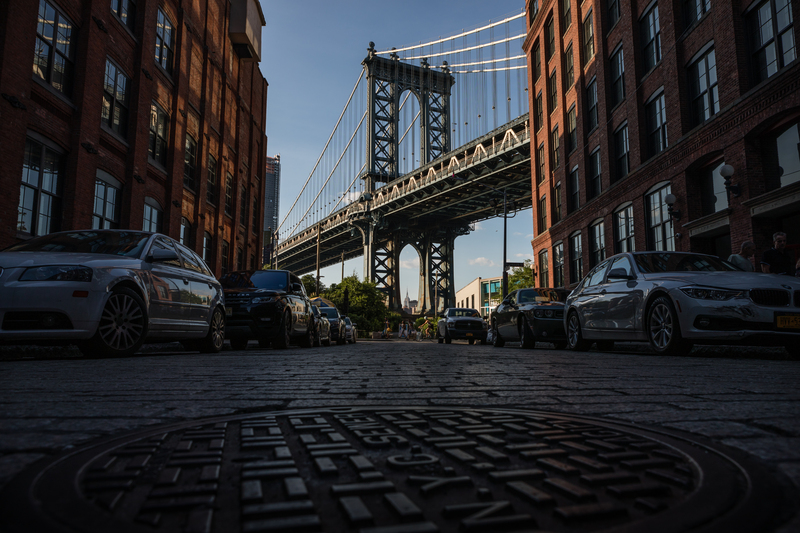 The building served as both a place to store tobacco and a customs inspection center for tobacco imports, the Landmarks Preservation Commission’s designation report about the Fulton Ferry Historic District says. The garden at St. Ann’s Warehouse is open to the public. Before you duck into one of the neighborhood’s rival pizzerias to warm up from your walk, take a look at the nearby Marine Fireboat Station. It stands at the edge of the dock at the end of Old Fulton Street, this close to the Brooklyn Bridge. The shingle-covered building at 1 Water St. was constructed in 1926. Hoses for FDNY fireboats were hung out to dry in its tower, a Brownstoner.com story by Suzanne Spellen says. Here are St. Ann’s Warehouse and the Brooklyn Bridge as seen from Water Street in DUMBO. The fire department maintains a fleet of vessels to battle conflagrations and handle emergencies along the city’s 450-plus miles of coastline and harbors. Brooklyn Ice Cream Factory, the fireboat station’s longtime occupant, recently closed. That’s because Brooklyn Bridge Park awarded the concession for the building to another ice cream shop, Ample Hills Creamery. It’s expected to open this summer, park officials said in a December announcement. The landmarked Marine Fireboat Station is currently vacant, but nevertheless lovely to look at.